As part of the Group's Vision, Priorities and Principles, a key element is the principle of "Keeping People Safe". As part of our continuous improvement strategy we believe that all Injuries are preventable and reported (along with near misses), so that we learn from them. 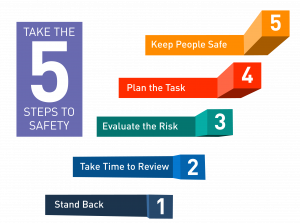 The purpose of the "Five Steps to Safety" is to raise awareness within the workforce of the need to review their work activity and assess if the controls in place are sufficient for "Keeping People Safe". We also want to encourage workers to report unsafe acts or conditions (near misses) on site and to provide a means in which to provide suggestions to improve our performance. Evaluate the Risk - Consider the sequence involved in carrying out the task and any hazards associated with it. How will the work affect yourself and anyone else? 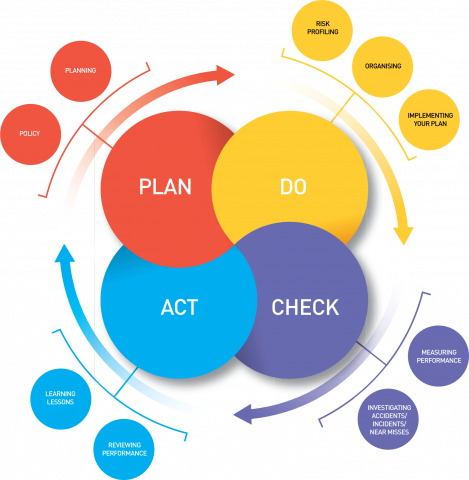 Plan the Task - Review what you need to do the task safely - What else do you need? Can the task be done in a different way which will reduce the impact on yourself and others? If you observe an unsafe act or condition and cannot deal with it yourself, please immediately inform your site manager. If you have any suggestions on how we can improve health and safety or would like to record any observations please complete a suggestion/observation card located in the welfare facilities. Please provide your name and email address if you would like us to feed back to you on actions taken.